Have you made something from one of my crafty tutorials? I always love seeing photos of what people make using my tutorials, so I thought I'd set up a Flickr group as a place for everyone to show off what they've been making! 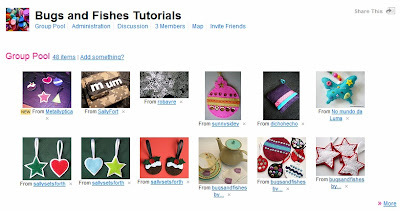 You can visit my Flickr group here - you can share your own photos if you're a Flickr member, just join the group and then add your photos of the things you've made from my tutorials to the group pool. There's also a discussion section, so if you've got any questions about the projects (e.g. where to source materials, etc) you can start a discussion topic about it. I'll be adding links to new tutorials here too, so you won't miss any projects. Hurrah! I just bought the book Fa-la-la Felt after I saw it on your blog and I've been dieing to try your gingerbread house ornament. If I manage to do it, I'll post it on the flickr group your created. Thanx for sharing your ideas with us.